In the beginning of the story, two men called Lennie and George travel through the Salinas near the south of Soledad, to a farm in hopes to find a new job. The author shows shows that Lennie is mentally ill because he portrays Lennie as a child who talks and acts different from others. Because of his mental illness, George tries to control Lennie and act like his guide, but Lennie continues to act like a child. Throughout the story, Curley tries to intimidate Lennie and at one point, Lennie tries to beat him up. Lennie is then hated on because of his actions. When Lennie kills a puppy in the barn, Curley’s wife comes in and talks to him. Lennie tells Curley’s wife his obsession to pet soft things and she allows him to feel her hair. Curley’s wife starts to scream when he starts to pull on her hair and Lennie accidently kills her in attempt to quiet her. Since George understands Lennie’s disability, he understands that it was unintentional, but society looks at it differently. George soon realizes that Lennie cannot continue to live that life because of his actions. I recommend this book to the people who like more realistic events than fiction. Because of the language and what the content of the book talks about, I would recommend this book to people in high school or 8th grade. The language may be too mature and the content may not be suitable for people. The vocabulary was not too challenging although there were a few words here and there that I needed a dictionary for. The author was very descriptive throughout the book and I could imagine what was happening clearly. I also felt like this book had a lot of meaning and relating to our society. The author showed their heavy accents very well. Although I thought the story was very well written, I thought the vocabulary could be improved. I would rate this book eight stars out of ten. 1. 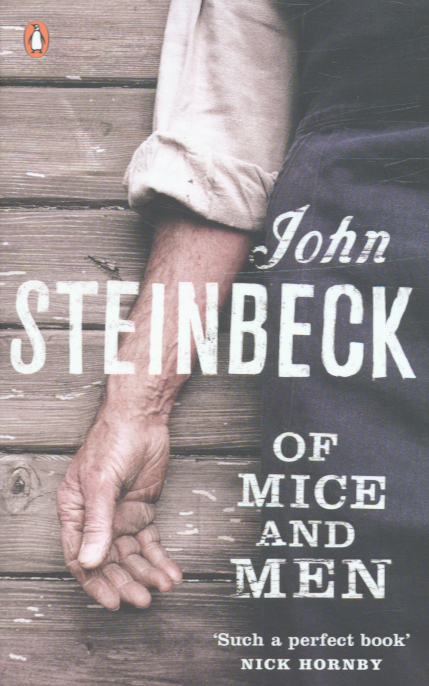 Why does George become angry when he notices the dead mouse in Lennie’s hand? 2. Why does George go recover the dead mouse? 3. Why does George always speak for Lennie? 4. Who does George and Lennie work under and what is their job? 5. Why is Curley’s temper so bad? 6. Why does Slim say “seems to give a damn about nobody”? 7. Why did Lennie have to hide in an irrigation ditch? 8. Why does Curley attack Lennie? 9. Why does Crooks tell Lennie to go away? 10. Why does Lennie become angry? 12. What does Lennie do when George throw the pup across the room? 12c. Lennie runs to it and strokes it because he cares about it unlike George. 14. Why does George kill Lennie? 15. What does George do before killing Lennie?